My first Warre is the one on the left. It’s the one I was really worried about not getting through the winter. It wintered over with only one box which is now on the bottom. I don’t know why I was so skeptical when people talked about getting honey bound. I guess I never thought I’d get ANY honey at all because the summers on the coast are so windy and cool. Our main goal was to provide a place for the bees to live, let them pollinate our flower and vegetable garden, and just take pleasure in watching them do their thing. 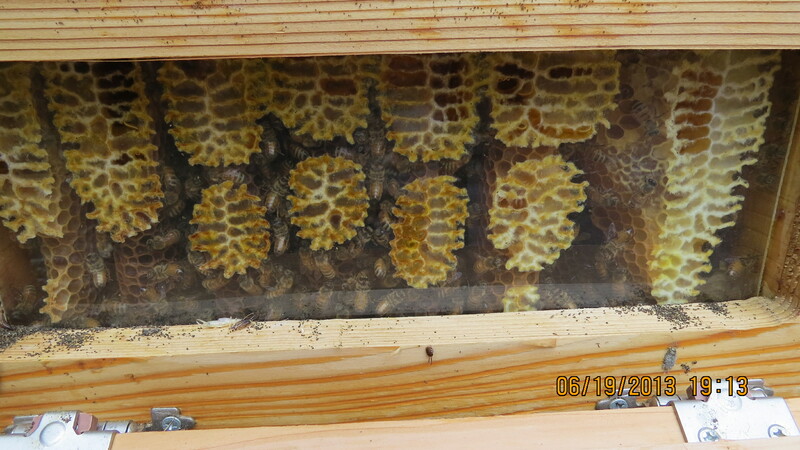 When we captured a swarm last year to inhabit the Warre, it was a small one which seemed to build the first box very quickly and then just stopped building. 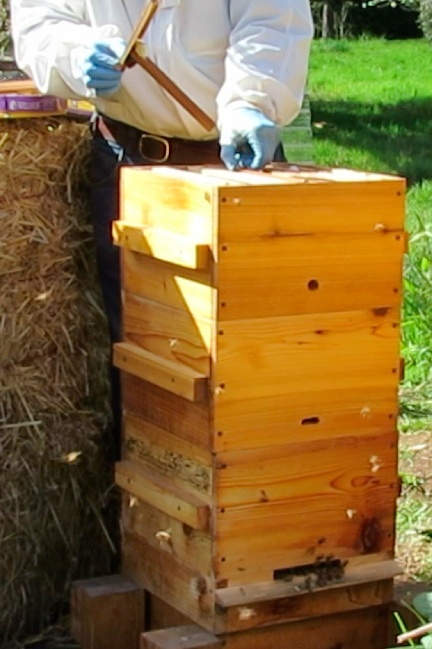 I wintered over with just one box and on the advice of many more knowledgeable people, fed the bees a dry sugar paddy. Bottom box (#1) over wintered successfully. So we added box #2 in February. On February 15, I added a second box. When the bees wouldn’t fill it, I added some comb ladders on March 24th. 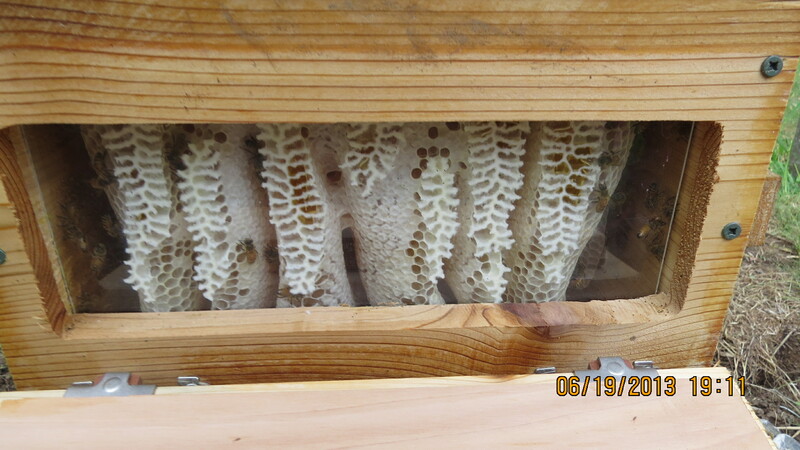 The bees immediately started building comb which is full now as can be seen below. 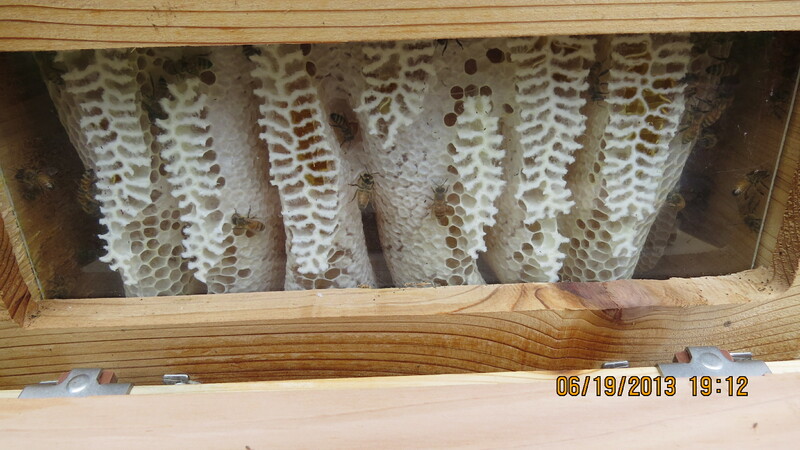 Box #2 As soon as the comb ladders were added, the bees built fast so the queen could lay. When it was 3/4 full, I added a third box. 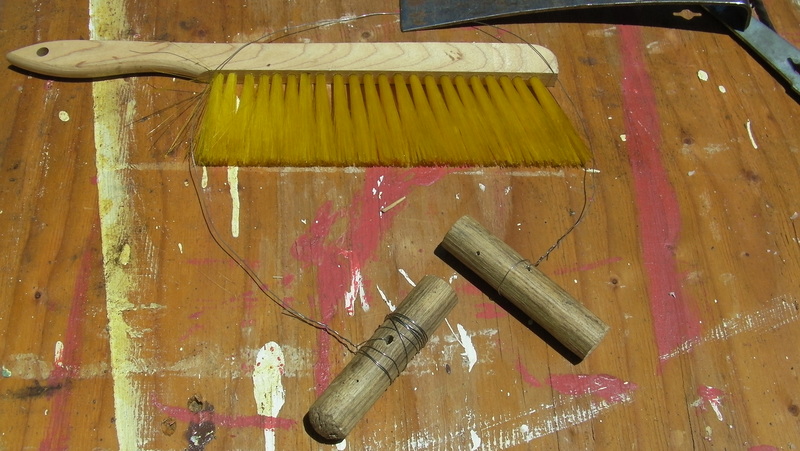 When box #2 was 3/4 full we added box #3, but comb was getting scarce so I tried using t-posts with a melted wax coating to act as a ladder. 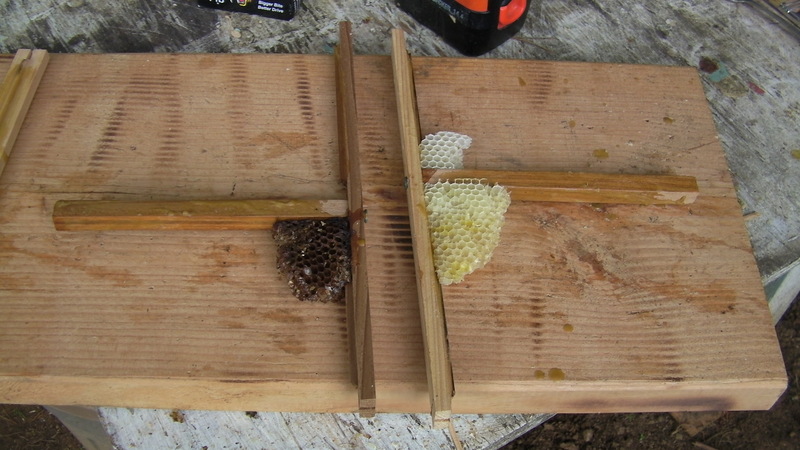 Small pieces of comb was ‘welded’ to the top bars. 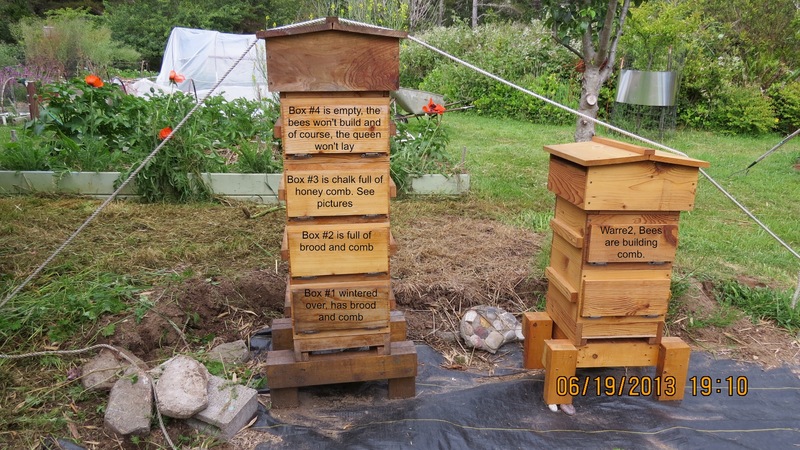 Box #3…adding t-posts with small bits of comb ‘welded’ to them on April 2nd. 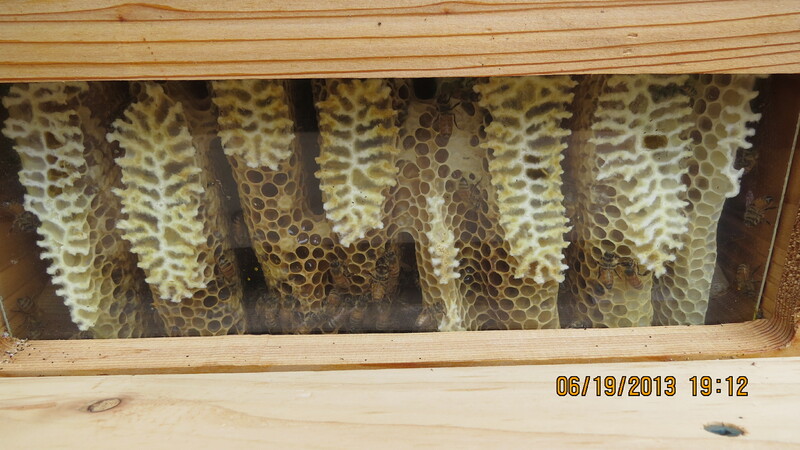 Box #3 is so full of honey, it’s blocking the queen from getting into the top box. The t-posts worked well. We didn’t realize we’d get any honey…and really didn’t want to take any…UNLESS there was an excess while a nectar flow was on. Oregon’s big nectar source of blackberries is going on right now, so we will put this box #3 on top and the empty box #4 will be inserted between #1 and #2. If they build that out, I’ll get to harvest the honey.